Shortly after the second presidential debate concluded Sunday, news broke that Indiana Gov. Mike Pence had cancelled a private campaign rally he had scheduled for the next day in New Jersey. The move fueled speculation — which remains unfounded — that he was considering backing out as Republican nominee Donald Trump's running mate. The Trump campaign's Ocean County chairwoman confirmed Pence had cancelled his Monday appearance at a private campaign rally and fundraiser in Toms River, New Jersey in an emailed statement to Ocean County Politics. The event was reportedly planned by the Ocean County Republican Organization to be held Monday at 6:30 p.m. ET. Ocean County Politics claimed sources within the GOP were saying the cancellation was a result of "scheduling conflicts" despite invitations for the event having been sent out a week before. Pence's cancellation comes as the Trump campaign attempts to weather a firestorm of bipartisan criticism following The Washington Post's release of a 2005 video in which Trump can be heard making predatory comments about women and boasting that his status as a celebrity enables him to "grab 'em by the p*ssy." While Pence may have wiped his calendar almost completely clean in the aftermath of the Trump tape, he doesn't appear to be ready to completely throw in the towel. Shortly after Sunday's 90-minute town hall style presidential debate ended, Pence tweeted his congratulations to his running mate. "Congrats to my running mate @realDonaldTrump on a big debate win! Proud to stand with you as we #MAGA," Pence tweeted. 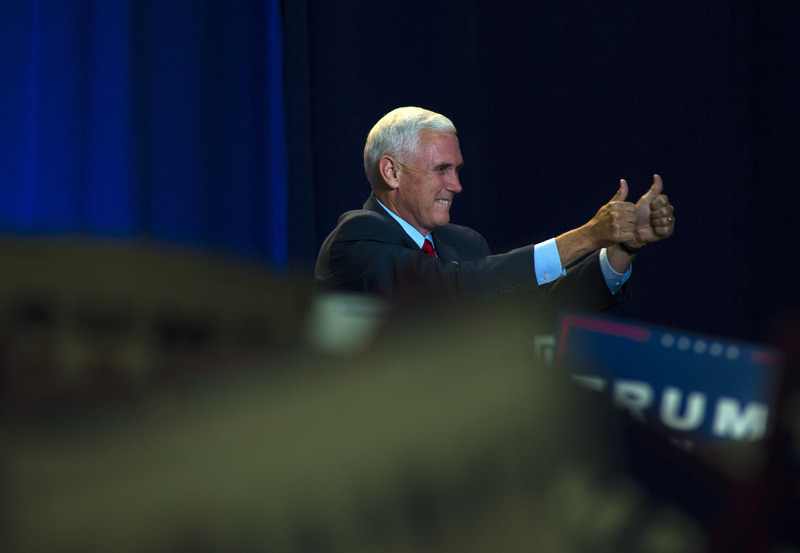 Further refuting speculation that Pence is taking time away from the campaign trail to mull over a potential exit from the Trump ticket is the fact that Pence will reportedly be holding a campaign rally on Monday — just not in New Jersey. According to Trump's official campaign website, Pence will spend Monday afternoon holding a town hall in Charlotte, North Carolina before heading to Fletcher, North Carolina for a rally at the WNC Agricultural Center that evening. The cancellation of Monday's event in Toms River could simply be a matter of crossed wires and scheduling conflicts. Or it could be that The Washington Post's drop of what is now commonly being referred to as the "Trump tape" has forced his campaign to re-examine how it can be most effective as the dust continues to settle around the GOP nominee. Either way, a "Pexit," if you will, doesn't seem 100 percent likely just yet given Pence's recent tweet of support.